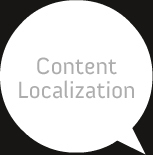 Content localization - converting content into a language that audience understands. Content localization is designing content for a specific target audience. It includes converting your content into a language that your audience understands.